The Paul Merage School of Business has raised $ 42,657 from 142 gifts! Thank you for your deep commitment to the future of academic excellence. When everybody gives, we all gain. Your gift is more than a donation to The Paul Merage School of Business. It is an investment in the future of Orange County, the business community and our collaborative culture. Today, you have the power to make a difference. By making a donation, you are helping deliver research and teaching excellence at The Merage School. Each individual donor boosts our rankings, which in turn raises the value of a degree from our school. In addition, these donations help The Merage School gain prestige, which means your degree will make you stand out from your peers. Who We Are: We are ambitious. We are intellectually hungry. We have a calling to deliver educational excellence valuing diversity, collaboration, inclusivity and respect. We celebrate both the academic tradition of the University of California and our innovative spirit as one of its youngest campuses. What We Do: We provide thought leadership and train professionals to drive value for the future of business and society, locally, nationally and globally. Where We Do It: We are the heart of the business community in Orange County, California; a vibrant ecosystem with global reach. As such, we are uniquely positioned to attract scholars, students and partners, domestically and internationally. How We Do It: We foster collaborations among our students, faculty, the university community and the region. We excel by providing access to, and growth within, our programs, faculty and staff. We innovate operationally to ensure we remain relevant and cost effective in a rapidly changing world. Thanks to Pamela Adams, MBA '98, every gift, up to $50,000, for the Paul Merage School of Business will be matched dollar for dollar, doubling your impact. Thanks to Diane Sagey '83, MBA '99, every gift, up to $2,000, for The Paul Merage School of Business will be matched dollar for dollar, doubling your impact. 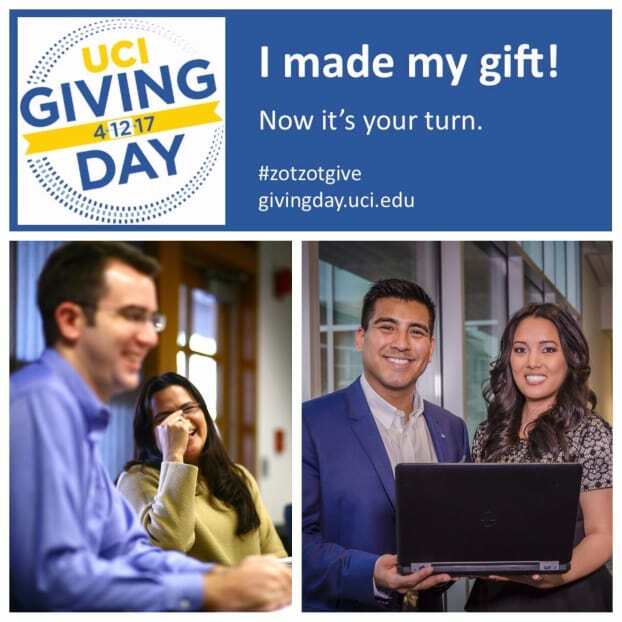 Thanks to Reza Sabahi, MBA '09, the first 100 gifts made to The Paul Merage School of Business before 2:00pm will unlock a $5,000 gift, and another $5,000 will be unlocked after an additional 100 gifts have been made before the end of Giving Day. Please help us in support of The Paul Merage School of Business today! Merage has unlocked a $5,000 challenge! The Merage School of Business just hit 100 donations, unlocking a $5,000 challenge! We hit the necessary donations to get $2,000 in matching funds for Merage! Thank you to all the donors who made this possible, especially our matching donor Diane Sagey! All gifts made to the Pam McGee Adams Financial Literacy Fund will be matched dollar for dollar by Pamela Adams, up to the first $50,000. All gifts made to The Paul Merage School of Business will be matched dollar for dollar, up to the first $2,000. Help us meet the challenge of unlocking a generous $5,000 gift for The Paul Merage School of Business by being one of the first 100 donations today before 5:00pm. Help us meet the challenge of unlocking another generous $5,000 gift for The Paul Merage School of Business by being among the next 25 donations before the end of Giving Day.